Hey y’all! It’s April from Grade School Giggles. I’m thrilled to be part of this month’s theme here at The Primary Peach. We’ve come to that point in the month when we’ve finished Groundhog’s Day and Valentine’s Day is over and done with. Even Presidents’ Day is wrapping up. So what’s left? What themes still need covered this month? Well, it’s still Dental Health Month and taking care of your teeth is so important, especially when you’ve been chowing down on some Valentine’s Day candy. 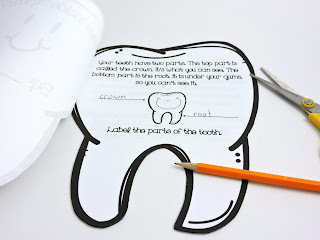 So, I thought today’s freebie should focus on learning about your pearly whites. So dig into some health and check out this fun little freebie. I love flip-flop books, because they are a fun and an easy way to organize material. Hopefully, you do too, because I decided to whip up a little flip flop book all about what’s inside of a tooth. Did you know that teeth have three layers: enamel, dentin, and pulp? Me either, but your kids will know about each layer after completing this flip-flap book. So, be sure to click on the picture and grab your freebie. 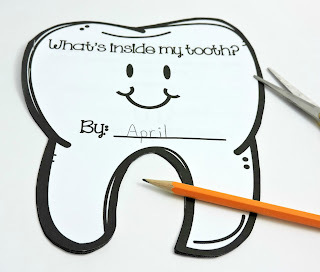 Hopefully your students will keep on smiling as they learn all about their teeth during Dental Health Month. 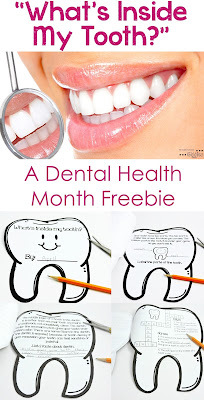 As you’re planning your Dental Health Month activities, you will also want to check out Deanna’s post right here at The Primary Peach where she shared some more awesome dental health resources. And...for even more ideas from The Primary Peach, be sure to follow us on Instagram, Pinterest, and Facebook to catch all the latest news and updates. This is vital for you because you don't want to find out that your health care does not cover when you need it most. 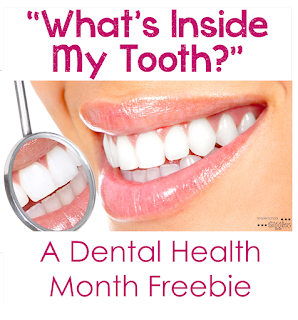 Dental health is just as important as health of any other body part and it is great that there's a month dedicated to it! I learned more about it from www.ninjaessays.org and it has been amazing! I am more enlightened about it after reading from here, this is some great work, keep it up! These insurance may not answer all your needs but you need to be meticulously considered it. Be certain that you study your plan thoroughly. Is it an HMO, or can the member utilise any service provider they went? This is critical. It is good to educate. Your teeth will be beautiful. Eating regimen changes decreasing your fat admission,accutane alternative expanding your foods grown from the ground consumption, or simply eating more fish can have a huge effect to your general health. You'll also find a selection of personal picks: Ocean of Games we individually love that didn't quite make the cut. Enjoy!" One of the most important and most strongest Dead Trigger 1 APK thing in universe are the teeth most Hungry shark world cheats apk of the people ignore Best d29 portable jump starter this factor and try to spend their days like wise top mod games.